All images by Jason D. Page. Used with permission. Photographer and founder of the Light Painting Brushes System, Jason D. Page, has created an in-depth tutorial showcasing his method of light painting to create a “Light Man”(or woman). Using tools from his unique lighting system, Page walks you through every step providing camera settings, ideal posing and environmental options, as well as potential trouble areas for those looking to duplicate the technique. 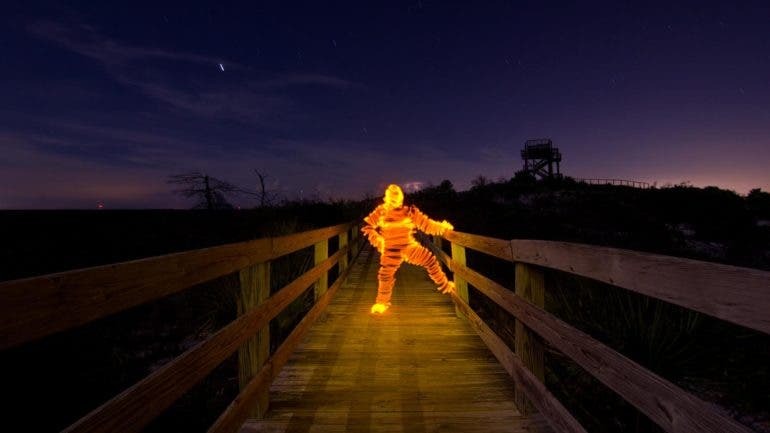 The resulting image showcases an illuminated figure with a fiery glow or something akin to what you’d see in a sci-fi film. It’s an easy-to-follow tutorial and potentially useful technique for those looking to do something creative with light painting. Check out the video below to see the complete tutorial. – Wear dark clothing so you don’t show up in the picture. – Pick a position that is easy to maintain, such as sitting. Page uses the G26 Flashlight, Universal Connector, Opaque Light Writer and Color Filter with hood for this tutorial, but other tools from the Light Painting Brush System can be used for different creative effects. To find out more about Jason D. Page’s Light Painting Brush System and see more tutorials on light painting visit his website here.